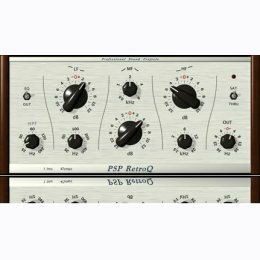 PSP RetroQ offers PSP Audiowareï¿½s unique take on a musical equalizer with unique sonic character and low phase distortion. This makes RetroQ sound smooth and musically natural. Itï¿½s shelf filters are based on fabulous-sounding VintageWarmerï¿½s filters, and PSP RetroQï¿½s addition of a mid-range filter is designed using the same internal architecture. An adjustable high pass filter is added to make the plug-in a complete program equalizer. It was optimized for use on groups and mixes, but it is equally at home in any situation in which you desire some gentle sweetening in your overall processing chain.